Easily compile text, images, videos, and other content in an interactive online format. 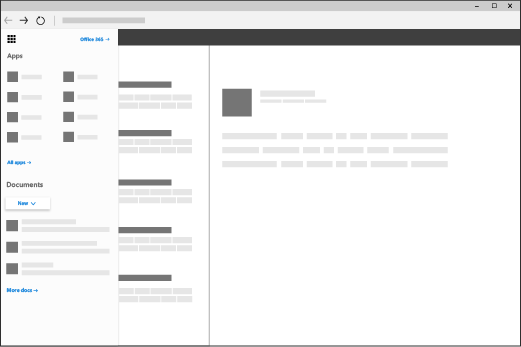 Apply designer-created layouts and color schemes, or let Sway suggest design elements that match your content. Search and import relevant content from other sources. Share your completed Sways on the web. Select Sign in on the top menu bar with your Microsoft account or work or school account for Office 365. 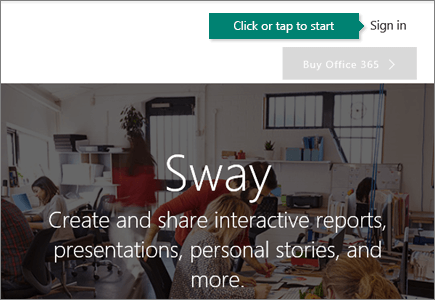 Note: Sway is free to use for anyone with a Microsoft account (Hotmail, Live, or Outlook.com). You can create more sophisticated Sways with more content when you use Sway as part of an Office 365 subscription. For more information, see Add more content to your Sways with Office 365. If you’re already working online within your organization’s Office 365 environment, you can connect to the Sway home page from the app launcher. Select the app launcher at the top left of the browser window. Select Sway from the Apps list. If you do not see Sway, select All apps. Note: If you prefer to use an app, the Sway app is available for Windows 10 devices. 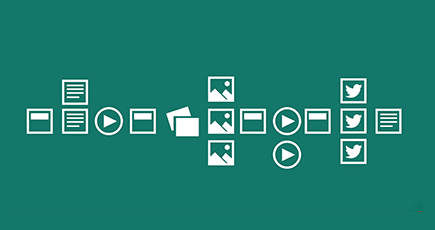 You can find the free Sway app for your Windows 10 device in the Microsoft Store.